An ABSA Bank credit card well managed can offer a host of benefits and be an awesome financial tool in your wallet. A monthly statement and online account account can keep you up to date with your credit card spending. To help you with your spending, credit card holders can benefit from a good many discounts and it’s a case of choosing the credit card that suits your lifestyle and your earnings. 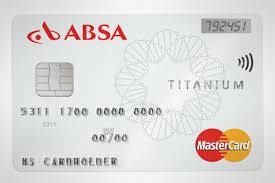 ABSA Bank offers credit cards. They are a famous bank in South Africa – one of its largest financial services organisations who interact with their customers through different channels and offering a comprehensive range of banking services. ABSA offers a range of credit cards, anything from their student credit card to their Affinity credit card to their platinum credit card as well as others. There is a credit card to suit all their customer’s budgets and lifestyle. ABSA likes to keep their customers up to date on how their credit cards work. So for instance they’ll tell you that most credit purchases attract interest from the date of purchase. However the cardholder pays off the transaction fully before the end of these 55 days, the credit card company will charge no interest. Cash withdrawals and fuel expenses are exempt from this interest-free period. ABSA advise you that with their credit cards, make sure that there is in fact credit before you make a purchase. They say that if you make all your payments on time, you’ll be able to maintain a good credit rating. • to apply for such as card call ABSA on 0861 114 411 or email them at contactcard@absa.co.za. To own the Platinum Credit Card, you’ll need to be earning R25 000 a month. You’ll be charged a monthly fee of R55.70 for this card and transactions are free. You also get Basic Travel Insurance cover for when you buy international return travel tickets. What ABSA credit card appeals to you according to your lifestyle and your budget. ABSA is inviting you to compare their credit cards or to call them on 0861 46 22 73 if you need more help with choosing a credit card that will put you on a roll.